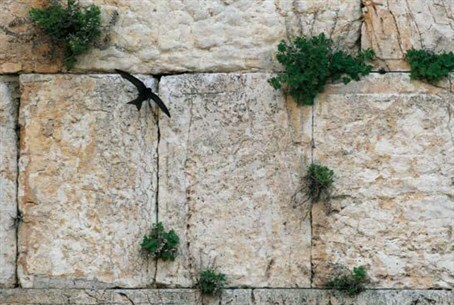 The Common Swift, a unique bird that spends most of its life on the wing, returns to Western Wall for a short vacation from Africa. The Common Swift, a unique bird that spends most of its life on the wing, returns to Western Wall for a short vacation from Africa. Nature-lovers are planning a welcoming ceremony Monday. The Friends of the Swifts Association, the Society for the Protection of Nature in Israel, and Tel Aviv University are working together to save existing nesting sites of the special bird. Its arrival at the Western Wall also symbolizes the approaching spring, said the sponsors of the welcoming ceremony. The Common Swift feeds on flying insects, which it hunts in the air, drinks while flying and sleeps on the wing. It spends most of the time living in South Africa in dense colonial groups and at the beginning of spring starts migrating north to its breeding sites. During mid-February it arrives in Israel, which is known to be one of its first breeding sites, and migrates back to Africa at the beginning of June, immediately after its nestlings have fledged. The Common Swift weighs only 35 – 45 grams, less than two ounces, but is a superior flier and an aerial acrobat. It has a thin, short body and impressive, long, scythe-like wings. Ever since humans have started building cities, the Common Swift has found Israel’s buildings perfect for nesting sites, including ancient holy sites such as churches, synagogues, mosques and temples. “The Western Wall in Jerusalem serves as one of the oldest Common Swift nesting sites in the world,” according to the sponsors of the welcoming event. Visitors during the period they are in Israel, can see them circling the wall. They said that a special study to map the nests was conducted in 2002 by researcher Ulrich Tigges and by the late Prof. Mendelssohn, during which 88 nests were noted. This study map served as a guideline during the work of strengthening the Western Wall, keeping the nests unblocked.